As the name implies, the breed originated in England and may have been a trained bird dog for 400 years. The spaniel is considered the root stock of the breed. The development of the modern English Setter is largely attributed to Edward Laverack (1800-1877) who acquired a pair of setters, “Ponto” and “Old Moll”, from the kennels of a Rev. A. Harrisson in 1825. For the next 50 years, Laverack bred a line of setters famous for their hunting qualities and beauty. During the latter half of the 19th Century, R.L Purcell Llewellin acquired dogs from Laverack and made selective crosses with a focus on hunting that resulted in a unique strain of dogs. Dogs from both strains were exported world-wide, but the labels remain; today’s field setters are still commonly referred to as Llewellin setters while show dogs are more commonly referred to as Laverack setters. The English Setter was recognized by the United Kennel Club in the early 1900's. The English Setter is clean in outline, elegant in appearance, and efficient in movement. It is a symmetrical gun dog with the ideal balance of strength, stamina, grace and style. 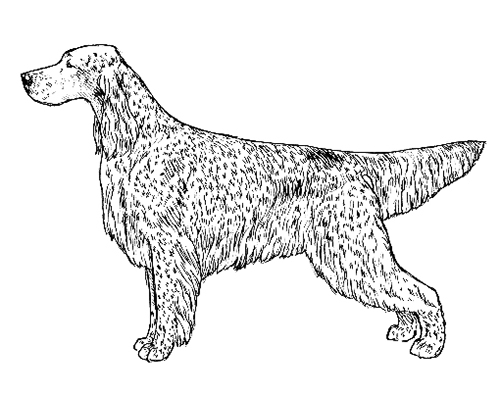 The field setter characteristically carries its tail higher, and is often smaller, lighter boned, and shorter coated than the show type. Color varies from white to tri-colored and includes white and orange ticked, white and blue ticked to tri-colored. The disposition is that of a people-oriented, athletic gun dog. The temperament is affectionate, friendly, without shyness, fear or viciousness. The head is long and lean, with a well-defined stop. The skull is oval from ear to ear and of medium width, with a moderately defined occipital protuberance. The muzzle is long and square, with a width in harmony with that of the skull. The lips are square and fairly pendant. On field type dogs, the skull and muzzle may appear to have less length, but are balanced and in proportion to the overall dog. Bright, mild, intelligent and dark brown in color. Is black or dark liver in color, except in white, orange and white, or liver and white, when it may be lighter colored. Carried close to the head, well back and set low, of moderate length and level with the eye. Not too throaty, should be long and lean and arched at the crest. The shoulder blade is laid back to approach the ideal angle of 45 degrees from the vertical. They are fairly close together at the tips, but with sufficient width between the blades to allow the dog to easily lower its head to the ground. The upper foreleg should be equal in length to the shoulder blade and form a 90-degree angle with the shoulder blade. This enables the elbow to be placed directly under the back edge of the shoulder blade and brings the heel pad directly under the pivot point of the shoulder, thus giving a maximum length of stride. When viewed from the front or side, the forelegs should be straight and parallel. The pastern should be short, strong, and nearly round, with the slope from the pastern joint to the foot deviating very slightly from the perpendicular. The chest should be deep, but not so wide or round as to interfere with the action of the forelegs. The back should be strong and straight and sloping very slightly from the withers to the tail. Loins should be strong and of moderate length. The length of the croup determines the tail set. The pelvis should slope at an angle of 30 degrees from the horizontal. The length of the upper thigh should be equal with the pelvis to provide balance. The upper thigh should be muscular, with well-developed lower thighs. It should have a well-bent stifle. Hocks should be wide and flat. When viewed from the rear the legs should be straight and parallel. Should be closely set and strong; pads well developed and tough; toes well arched and protected with short, thick hair. Tail should be straight, taper to a point, and reach to the hock joint. Tail carriage is level with the back. The field-type carry their tail considerably higher and, when on point, can exhibit a nearly vertical “12 o'clock” tail, making it visible in taller cover. Regardless of the degree of carriage, the tail is straight, never sickle shaped, and should not curl above the level of the back. It should have a cracking action like a buggy whip while running and searching for game. Should be flat and of good length without curl, not soft or woolly in texture. The coat should have moderate but adequate feathering on the ears, chest, belly, underside of the thighs, the back of all legs and on the tail. It Field type setters typically carry less length of feathering but retain the same properties of texture. Black, white and tan; black and white; blue belton; lemon and white; lemon belton; orange and white; orange belton; liver and white; liver belton; and solid white. Dogs without heavy patches of color on the body, but flecked all over, are preferred. About 25 inches and 55 to 70 pounds for males, about 24 inches and 50 to 60 pounds for females; however, allowances are made proportionately to include the smaller and lighter field type setters. An effortless graceful movement demonstrating speed and endurance while covering the ground efficiently. When moving at a trot, the properly balanced dog will have a tendency to converge toward a line representing the center of gravity of the dog. The English Setter has become two distinct types in some parts of the world. In North America, in particular, while show type setters have won awards in some hunting events, field trial dogs are rarely if ever competitive in the show ring. 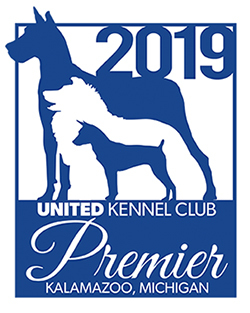 It should be the goal of all English Setter breeders to adopt and promote the UKC philosophy of the "total dog,” that is, to have a dog that is a good example of the breed standard and can do a good job for which it was created, to hunt.